The effective rate of capital gains tax (CGT) has increased dramatically in recent years. 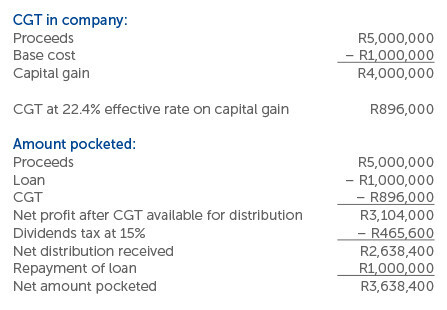 When CGT was introduced in South Africa in 2001 the effective rate for companies was 15%. The effective rate is now 22.4%. So, since 2001 the effective rate of CGT for corporates has increased by nearly 50%. In addition, when a company distributes a profit after tax to its shareholders, they pay dividends tax at a rate of 15% (unless the shareholders qualify for an exemption, or a reduced rate). So, when a company realises a capital profit, and distributes the profit to the shareholders the effective tax rate is 34.04%. In other words, more than one third of the profit goes to the taxman. A close corporation is treated the same way as a company for tax purposes. It has accordingly become more important than ever for taxpayers to reduce their tax bill on immovable property. 1. Hold the property in your own name. Natural persons pay CGT at a maximum effective rate of 16.4%. And dividends tax does not apply. So, if you hold the property in your own name you pay less than half the tax you would pay if you held shares in a company which in turn owns the property. Naturally, you should not only take into account the incidence of CGT and dividends tax when deciding whether to hold property in your own name or not. For example, if you hold commercial property in your own name and you let the property, depending on the amount of rental you generate, you may need to register and account for value-added tax (VAT). Also, you are personally liable for the debts relating to the property. So, if you borrow money from a bank to finance the property, the bank would also be able to attach your other assets – and not only the property – to satisfy its claim. You could also hold the property in a trust – an effective vehicle to hold property from a tax and commercial perspective. However, there have been rumblings recently on the part of policy-makers about the way that trusts are taxed and you should exercise caution when thinking about using a trust. 2. Keep accurate records of costs. Put simply, CGT is levied on a capital gain realised on the disposal of property, that is, on the difference between the proceeds on disposal and the base cost. The base cost is essentially the sum of expenditure incurred to acquire, improve and dispose of the property. Clearly, therefore, it is important to ensure that your base cost is determined correctly. To that end you should diligently store records of every amount you incur in relation to the property, notably, the costs of constructing or refurbishing the buildings on the property. Even small amounts add up over time. 3. Sell shares and claims. Consider the following case: You formed a company to acquire commercial property. The company paid R1,000,000 to buy the property. You lent that amount to the company. Many years later a person offers you R5,000,000 for the property. The share capital in the company is a nominal amount of R1,000. In other words, in the case where you sell the shares and loan in the company, as opposed to the case where the company sells the property and distributes the profit to you, you will pocket R705,764 more. Now, an astute buyer may be disinclined to buy the shares and loan. First, the purchaser may think that they are taking over a company with skeletons in its closet. For example, the buyer may be nervous about the company’s VAT affairs. Second, the buyer would be taking over the “latent” CGT and dividends tax relating to the property. In other words, if the buyer bought the property from the company their base cost would be R5,000,000; if they bought the shares and loan then the company would still retain its base cost of R1,000,000 and the buyer would need to account for dividends tax when the company distributes the net gain to them. 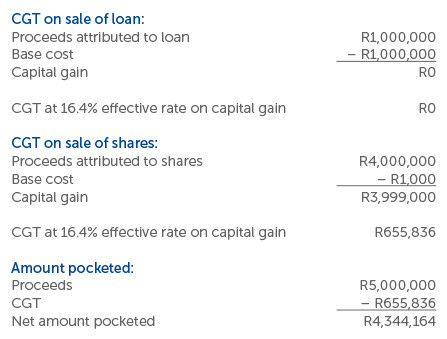 One way of inducing the buyer to take the shares and loan is to reduce the price. In that case you may still pocket a higher amount after tax than would have been the case if the buyer bought the property. The benefit to the buyer is that they would pay less money now which they could use to fund the “latent” CGT and dividends tax in future, and possibly have money to spare. You could also offer the buyer comprehensive warranties to cater for any hidden liabilities in the company. One could even place a part of the price in trust (escrow) for a period of time. The buyer would not need to go through the hassle of registering for VAT. As a final inducement to the buyer you could offer to restructure the property holding using the corporate relief provisions so that the buyer could hold the property in a new company with your company having been deregistered or wound up.